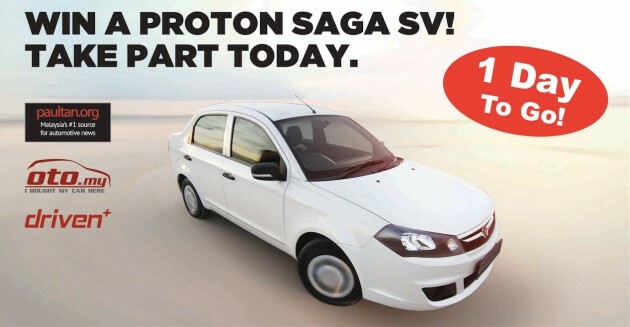 Home » Special Coverage » 2013 KL Motor Show » Win a Proton Saga SV 1.3 CVT with Driven+ and oto.my – just one more day to go to try to win it! Win a Proton Saga SV 1.3 CVT with Driven+ and oto.my – just one more day to go to try to win it! Ever since the Win a Proton Saga SV contest was launched about 2 weeks ago, we have been receiving overwhelming response with participants trying their luck to drive home a brand new Saga SV 1.3 CVT. For those of you who have not taken part in the contest just yet, you still have 1 more day to go! The contest will end tomorrow, Dec 1 at the strike of 11.59pm. Taking part is quite simple, you just need to download Issue 6 of the Driven+ interactive magazine for free from Apple Newsstand for your iOS devices or from Google Play for your Android machines. Once you have downloaded the latest issue, simply fill up the contest form and you are good to go. We are also giving you the opportunity to double up your chances to win. Simply go to oto.my’s official Facebook page, then hit the KLIMS ’13 Contest tab and fill up the contest form, that’s it! With just over 36 hours left, you have no time to lose! The Win a Proton Saga SV contest is brought to you by the Paul Tan Automotive Network, bringing you Paultan.org, Malaysia’s no. 1 source for automotive news and oto.my, our automotive classifieds website with intelligent features such as listing displays on Paultan.org. In the list is also the Driven+ interactive motoring magazine and the latest iteration of the Driven auto review video series, giving you auto reviews in a fun yet exciting way. Alhamdulillah, Asyrof sudah sertai kontest ini seminggu lalu.